In this assignment you will extend our simple resume database to support Create, Read, Update, and Delete operations (CRUD) into a Education table that has a many-to-one relationship to our Profile table and a many-to-many relationship to an Institution table. We will add an JQuery autocomplete field to our user interface. This assignment will also feature a jQuery auto-complete field when entering the name of the school. This assignment will add two more tables to the database from the previous assignment. We will create Education and Instutition tables and connect them to the Profile table. You must create the Institution table first so that the CONSTRAINTS in the Education table work properly. Like in the Position table, the rank column should be used to record the order in which the positions are to be displayed. Do not use the year as the sort key when viewing the data. This will allow you to have some university names pop up when you are typing ahead in the School field. We will be extending the user interface of the previous assignment to implment this assignment. All of the requirements from the previous assignment still hold. In this section we will talk about the additional UI requirements. add.php You will need to have a section where the user can press a "+" button to add up to nine empty education entries. Each education entry includes a year (integer) and a school name. view.php Will show all of the education entries in an un-numbered list and the positions in another un-numbered list. edit.php Will support the addition of new position or education entries, the deletion of any or all of the existing entries, and the modification of any of the existing entries. 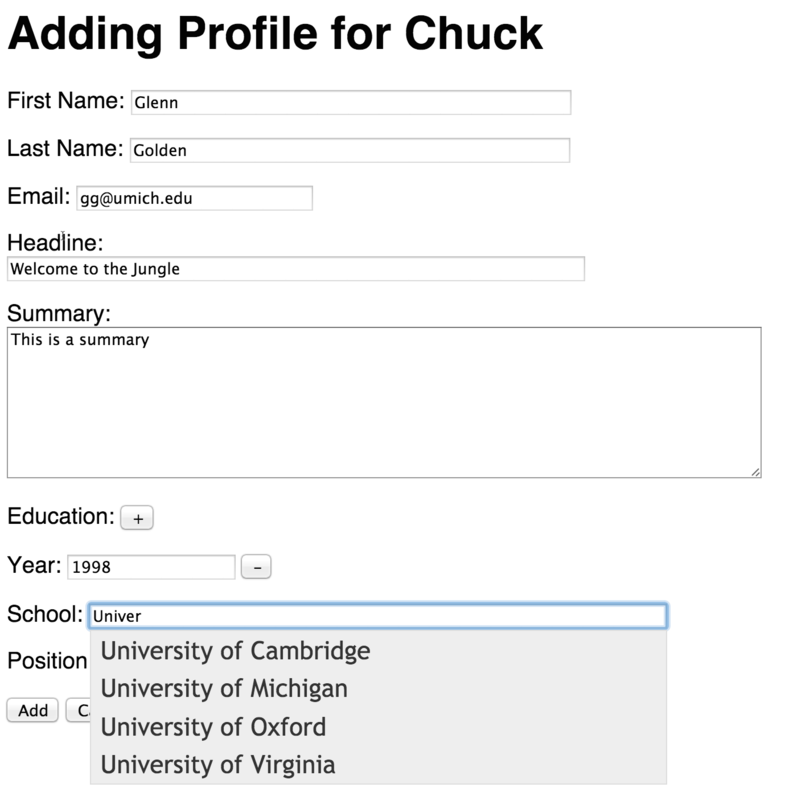 After the "Save" is done, the data in the database should match whatever positions and education entries were on the screen and in the same order as the positions on the screen. In addition to all of the validation requirements from the previous assignment, you must make sure that for all the positions both the year, description and institution name are non-blank and that all years are numeric.